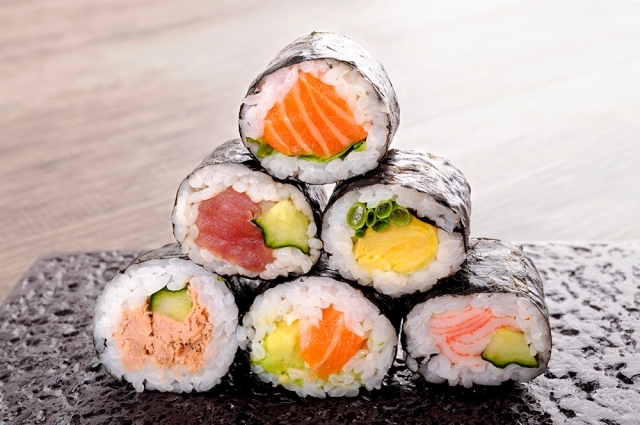 Have you heard of, and possibly confused: Nigiri, Temaki, Maki, etc. and want to know the different between them? Have you ever come into a Japanese restaurant and found yourself stunt at a numerous options in their long lists of sushi? Do you want to make sushi at home or at special occasion? If you answer yes to any of the above questions and possibly any other, then this is the article for you. Beware though, you will be hitting a wall of text (and pictures) on various different types of sushi, but hopefully you will get a clearer pictures on all the sushi variety, their ingredients, terms/names and sidekicks. Oh, feel free to use the table of content to navigate the page for your convenient. Don’t forget to leave a comment, and just ask any question popping up. Basically, sushi is any type of dish that contains seasoned sushi rice as one of its ingredients (see How to cook sushi rice). 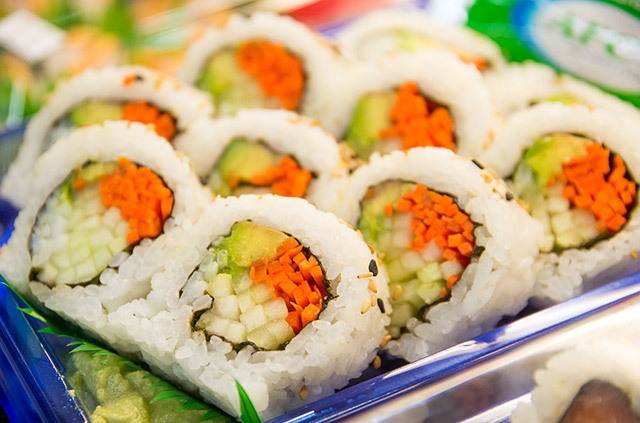 Of course, it is a Japanese cuisine, found and developed since ancient Japan, no doubt; but due to the highly popular, nowadays you could find sushi everywhere. 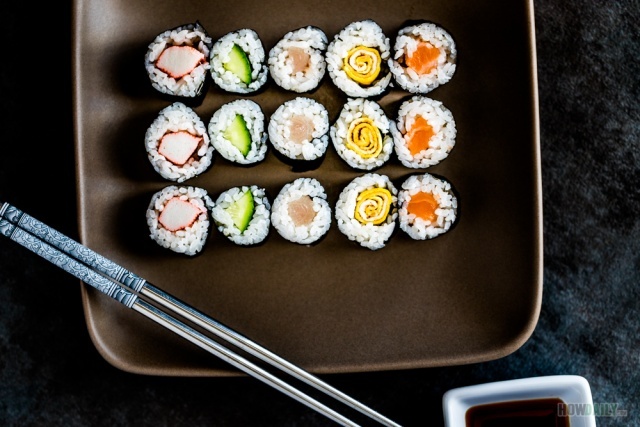 Sushi, what used to be a Japan’s fast food that sold in street stalls, has developed into international trend across the world, from street markets to luxurious restaurants. The taste is differ vastly from region to region too. 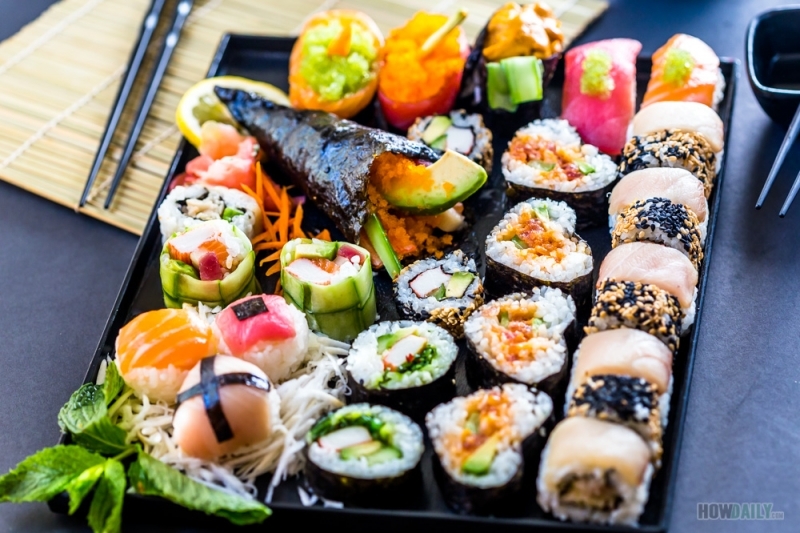 For instance, in Japan, common sushi tend to be more flavor concentrate and simple, with few types of or even single ingredient(s) in each rolls (i.e. tuna roll, ume roll). On contrary, in the States (or the Westerners), we love them all in combination, with the addition of cream cheese, avocado, crab stick, soft shell crab, salmon… (see list of popular American sushi rolls) Oh, and the pieces here are quite large too, not the typical bite size like in Japan. 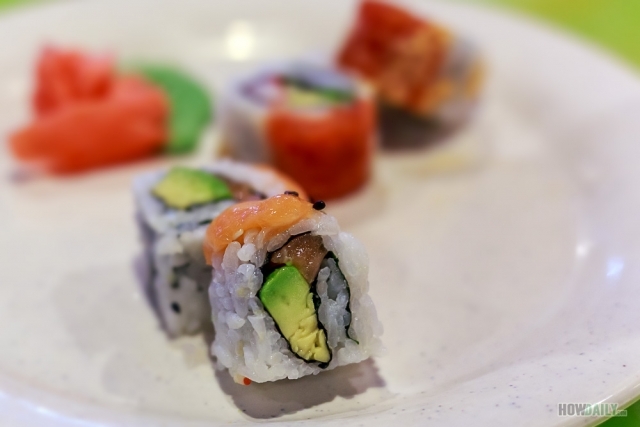 Due to this, it’s kind of hard to preserve the sushi etiquette: eating a sushi piece, be it nigiri, sashimi, or maki in one bite without putting its remaining down. I guess that’s why they passed out the extra serving plates in restaurants here. 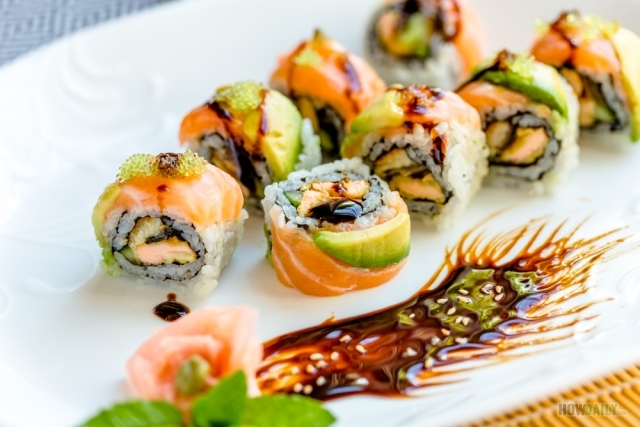 Most Sushi beginners tend to confuse between sushi and sashimi. Just remember that while sushi is the piece with seasoned rice and toppings, sashimi is just the “meat” itself, often raw. Zushi or sushi? You would come across this occasionally. They’re both corrected, and mean the same thing, you just use sushi when the word is standalone, and turns to -zushi whenever there is a name prefix. 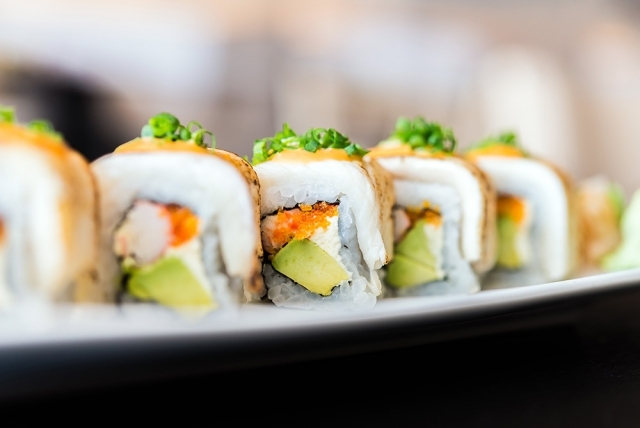 So without further ado, let’s dive into the details on all the different types of sushi that are popular on the market. Nigirizushi or Nigiri the most traditional form of sushi, consists of a single topping over a palm-pressed compact oblong sushi rice. Any small hand pressed sushi using your palm belong to this category. Some common raw toppings include thin or thick slice of sashimi like: salmon –Sake, tuna –Maguro, yellow tail –Hamachi, white tuna –Escolar, squid –Ika, clams –Hamaguri, whelk –Tsubugai, red snapper -Kurodai, butterflied scallop –Hotate, etc. These topping, when used raw usually has an under-coat small amount of wasabi. The best nigiri is the one that has bite size mouthwatering sushi rice and thick enough raw topping to complement the flavor. Sushi chefs had to spend years of practice before mastering cutting technique and variety flavor/texture nature of each species. 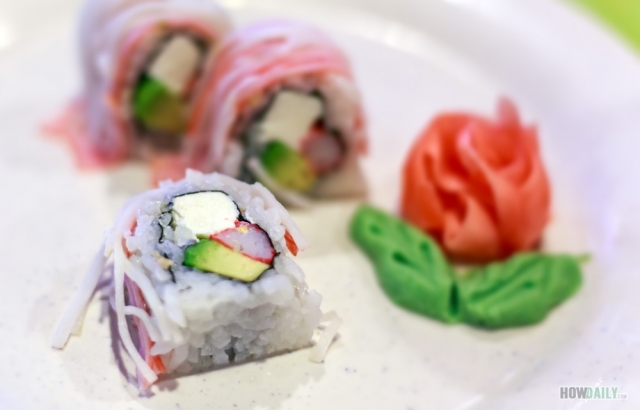 Sometimes, you may find those ingredients primed differently to achieve distinct flavor before bedding the sushi rice. Common priming include sear, smoke, cure and light cook with some sorts of dressing/seasoning. Sear beef -often used Wagyu or Kobe for their special flavor, salted mackerel –shime Saba, smoked salmon, octopus –Tako, boiled sweet shrimps –Ebi… are some examples. Then there are toppings like broiled fresh water eel –Unagi, surf clam –Hokkigai, sea eel –Anago, imitation crab –Kani, sweet egg –Tamago that are usually bounded by a thin nori strip to the rice. 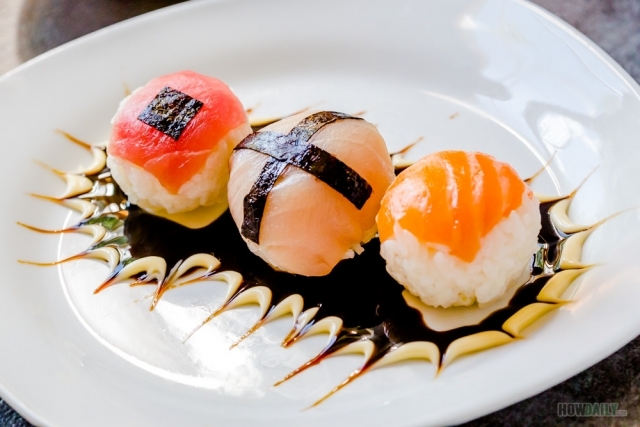 In most restaurant, you will find Nigiri to come in pairs per serving size. To make Nigiri, form a decent amount of sushi rice in the palm of your hand into an oblong shape, or use a Nigiri mold for easier shaping. 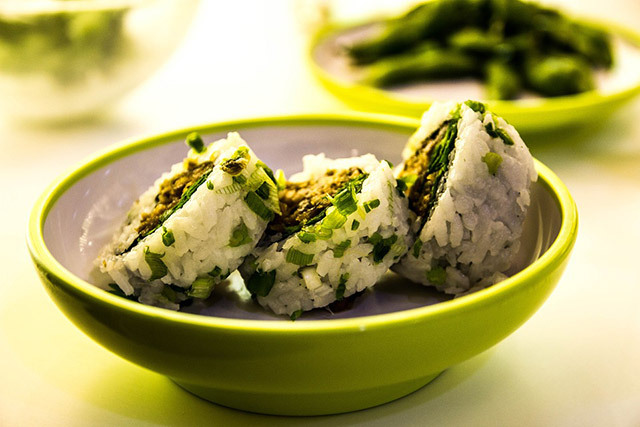 Then lay the rice ball onto a plastic wrapper, add topping with a little dab of wasabi underneath, wrap, mound and press to compact. A note on the bedding sushi rice is that to make it stronger than you would regularly season (more salt and less sugar per say) to accompany the sashimi better. That’s why some restaurant would serve these over Himalayan salt slab to enhance the flavor. Temari -sushi is a variant of Nigiri that is in small round ball shaped instead of the usual oblong. These colorful balls of sushi combine vibrant contrasting colors sashimi or cooked vegetable (to soften them) over seasoned sushi rice; that resemble those decorative ornaments(hence temari name). These are usually served during Hinamatsuri(Japan’s girl day) or special occasions in large batch of impressive colorful balls. Gunkan maki is also called Japanese warship due to its overall shape look like that of a battle ship. 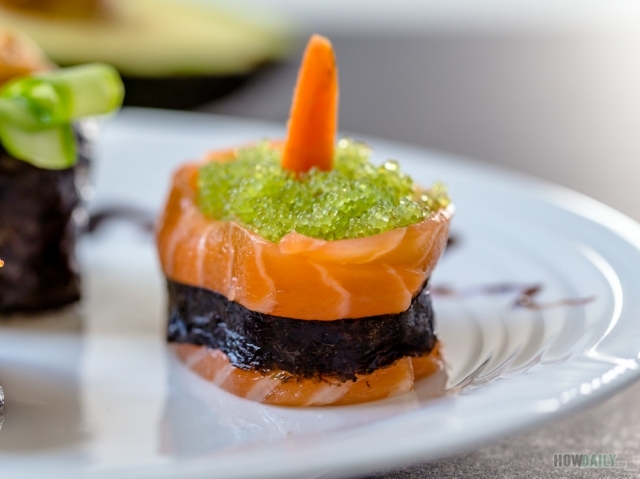 It’s actually a ball of Nigiri that has its perimeter wrapped by a seaweed –nori strip with extra height leaving a bounded empty space atop the rice ball for loose ingredients. 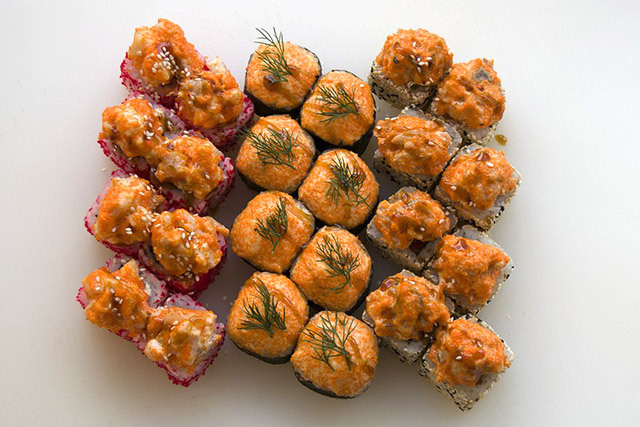 The most common toppings for Gunkan maki are sea urchin –Uni, salmon roe –Ikura, capellin eggs –Masago, oyster –Kaki, bay scallops –Kobashira, fermented soybean -natto and quail eggs yolk –Uzura no tamago. Other raw ingredients are also used through dicing, chopping, smashing; then either go alone or combine with spice, sriracha, kewpie mayo, or panko crumb to create a unique mixture (varied by chefs) and place atop the Gunkan. Gunkan is served and priced by pieces, often at a higher price range compare to other rolls’ pieces, mainly due to its exotic ingredients and longer handling times (detailed presentation). Makizushi or Maki is of course, a type of sushi that has ingredients wrapped in sushi rice filled seaweed -nori and rolled. You will often see them in a long cylinder (maki means roll per say), with the exception of Temaki. 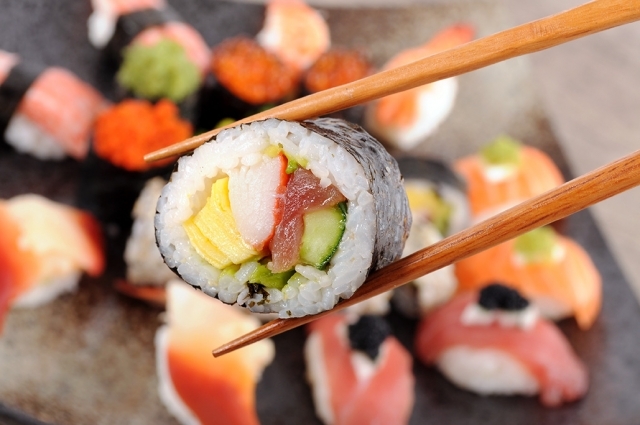 Maki is a very popular sushi type, along with nigiri to the world. Filling/topping ingredients for maki can be anything, from cook to raw, whole, slice to chunk, even puree work. They can be fruit, vegetable, pickle, meat, seafood…just anything edible. 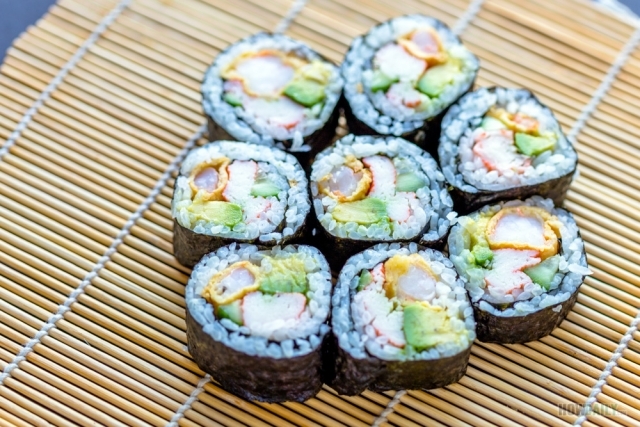 The best sushi rolls will have all ingredients & toppings hold well together, e.g. not crumble down when eating; everything should be fresh whether cook or not; the flavor should blend well and complementing one another; and the scent should be pleasant too. Common wrappers for maki is dried seaweed -nori, but sometimes you could find them nicely wrapped in colorful soy wrappers too. Same story goes for ultra thin omelette, perilla leaves –Shiso, thin sliced cucumber, or just about any thing that is flat and pliable potential. I used to roll mine in long smoke salmon strips, and that just come out amazing as well. 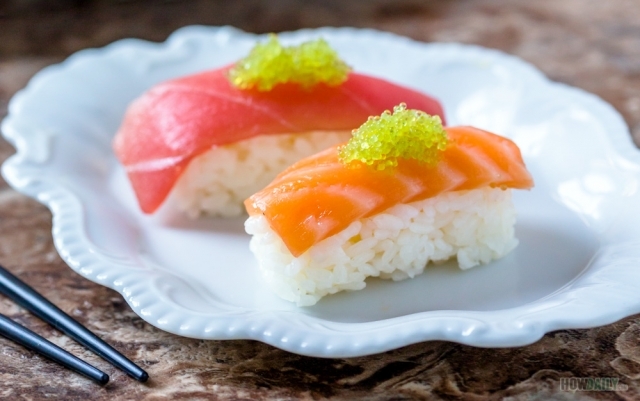 For detail on how to roll makizushi, visit this article. 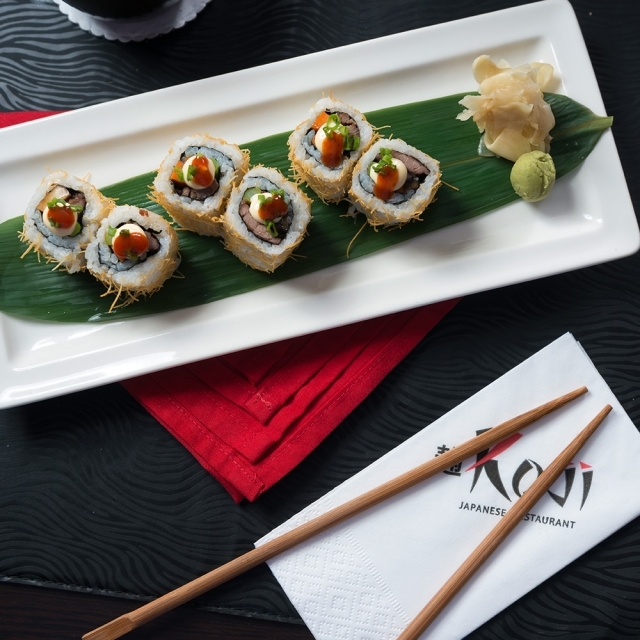 As maki means roll, so the classification is just on how the roll is made. Hosomaki (thin rolls) is a common type roll, very popular and widely use in Japan for lunch, snack, picnic,etc due to its bite size when cut and flavor concentration. It is a small cylindrical roll (about 1-inch diameter); usually contain only one filling along with the sushi rice inside and nori wrapped around. To roll a Hosomaki, you will need a half sheet of nori (4×7 inch) so just fold your nori sheet in half and tear. You would then place the half nori sheet on bamboo rolling mat -makisu, smooth side down and spread 1/2 cup of seasoned cook sushi rice evenly atop. Finally, arrange filling ingredient and roll tight. Negitoromaki – diced fatty tuna belly –toro mixed with chopped scallion –negi, one of the most creamy cheesy favorite in Japan. Kappamaki – named after Japan water imp(greenish color), it actually filled with sliced cucumber to cleanse between meal. Tsunamayomaki – a mixture of smashed canned tuna and kewpi mayo. Hamachi maki – diced young yellow tail. Natto maki – popular in Japan, it’s kind of smelly; made of fermented soybean. Umeboshi maki – extremely sour pickled plum to refresh your taste bud. Similar to Hosomaki, Chumaki is just the next step up in size. It’s a bit easier to roll and contains 2-3 ingredients making it about 1.5 inch diameter. To make this roll, you could either use the full 8×7 nori sheet, or just fold and tear off a quarter and saving it for a gunkan. A little close to 1 cup of cooked sushi rice is what you will need. Add the ingredients and just roll like you would on a Hosomaki. Anakyu – salt water eel and thin slices cucumber. 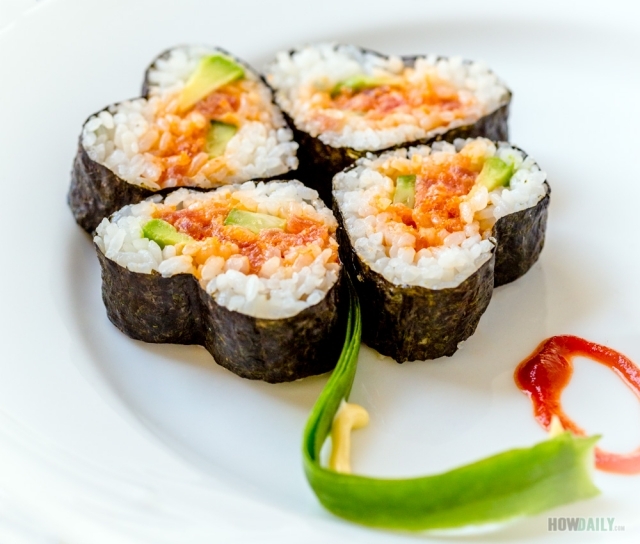 Spicy tuna avocado roll – ground tuna mixed with Sriracha, rolled with slices of avocado. Umekyu maki – pickled plum and cucumber, double the clean. and most of the smaller size Western originated rolls. Similar to the above two cousin’s rolling method, this one use 1 1/2 cups of sushi rice over a full nori sheet instead. This is the largest of all Maki, typically 2 to 2 1/2 inch in diameter. 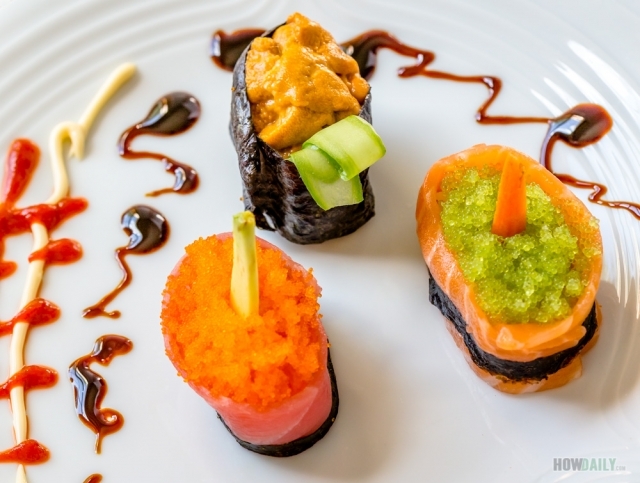 In Japan, Futomaki usually contains various contrasting color veggies and pickle, sometimes with sakura denbu(fish powder) mainly for decorating purposes when serving at special occasions. 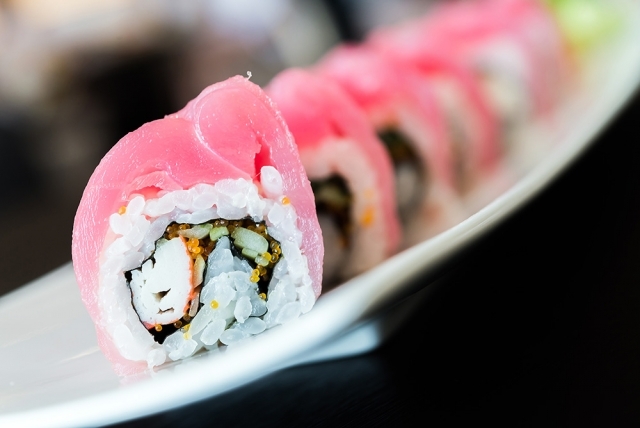 An extremely popular Futomaki in Japan is the Ehomaki. Ehomaki – a special Futomaki made of any 7 ingredients, in sync with the seven gods of fortune, hence the name literary ‘fortune roll’. It is consumed as a whole (uncut) in one continuous attempt on the night of Setsubun (February 3rd, the mark of Spring. Originated from Osaka are but spreading enormously around Japan. Some frequently used fillers are: sweet fish powder -sakura denbu, dried gourd -kanpyo, cucumber, sweet omelet -tamagoyaki, eel-unagi, freeze tofu -koyadofu, shiitake mushroom, Japanese pepper -sansho, spiced cod roe, roast beef, etc. On the other hand, Futomaki is more commonly used in the States. 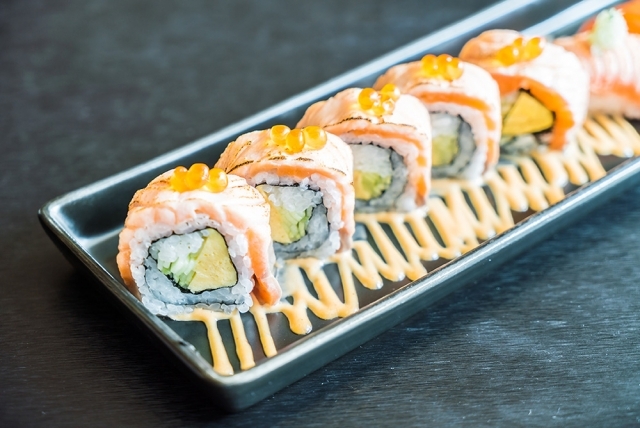 As said before, most Japanese restaurants in the West seemingly to serve their rolls larger with more ingredients to provide special twists and combinations. This is both a good thing and a bad one also. The good: the taste is surely unique and varying from one chef to another due to their add-on ingredients. The bad is large roll means higher in fat and a whole lot more of empty calories. It is also impossible to chow down any Futomaki pieces in one bite though. Roll down to see list of most popular American sushi rolls, which mostly fall under futomaki and/or uramaki categories anyway. In addition to soy sauce and pickle ginger, common sauce for those rolls are unagi sauce and spicy mayo. 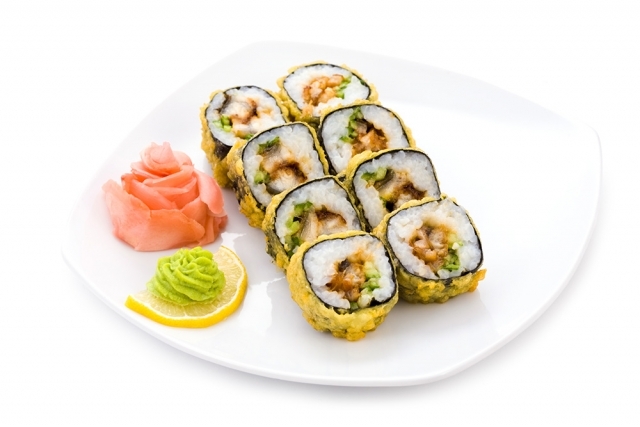 Uramaki or inside-out roll, is actually a Western ‘s invention as a result since the creation of the California roll. 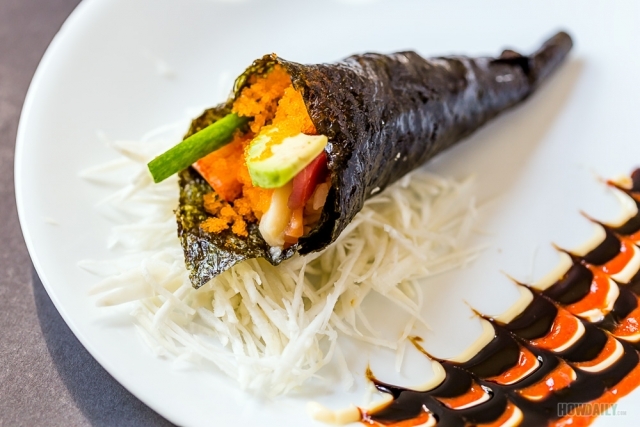 Basically it is the flipped nori with sushi rice on the outside wrap around certain ingredients, oftenly crab stick -kani, avocado, cream cheese, shrimp tempura, etc. 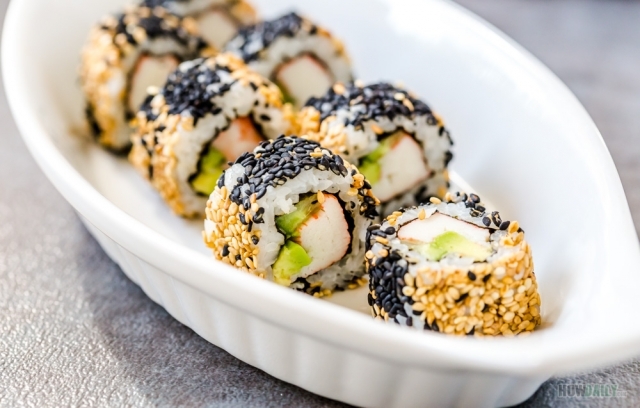 The roll is then cover with roasted sesame (enhance flavor and reduce stickyness) or other toppings. 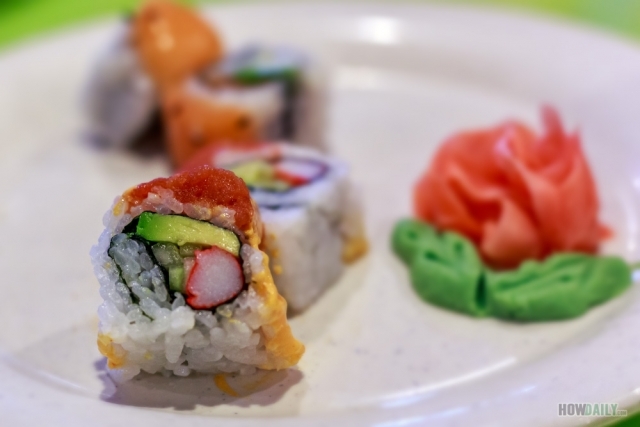 A majority of Western’s sushi rolls are uramaki variants. 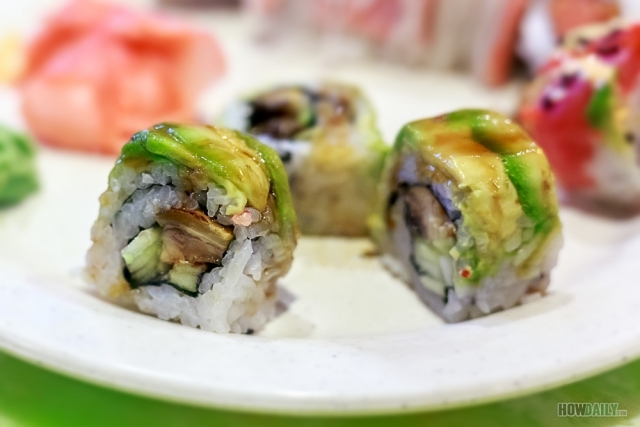 See list of popular American sushi rolls for description on specialty rolls around the States. Note that each chef might has his/her own creation of the same roll with different technique and fillings/toppings. So keep an open mind and indulge your taste bud. Temaki is the cone shape hand roll with nori on the outside. This is the sort of roll-as-you-eat thingy, as most Temaki is served immediately upon rolling to prevent the nori from loosing its crispiness. Temaki is rolled by using about half of the nori sheet, then adding a small amount of sushi rice, and equal length strips of filling ingredients. You would now start rolling in a triangular motion. Fillings for temaki can be anything, but usually some sort of fish (tuna, salmon, etc.) and veggies. Chirashizushi or Chirashi (e.g. scattered sushi or bowl sushi) is a bowl of sushi rice with various toppings. 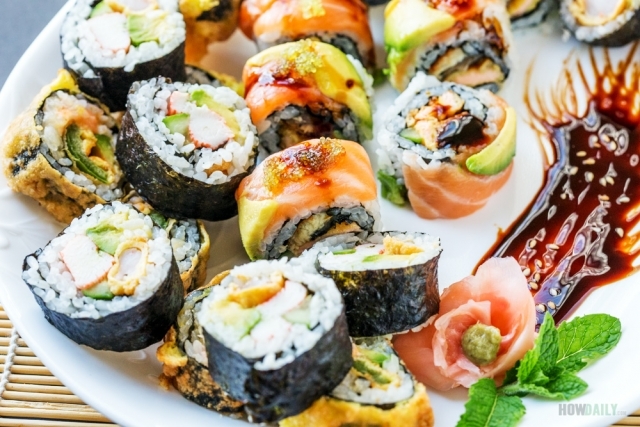 This can be ranged from the most budget and easiest sushi recipe to the most expensive and exotic; all depend on the number of toppings being served over rice bed. 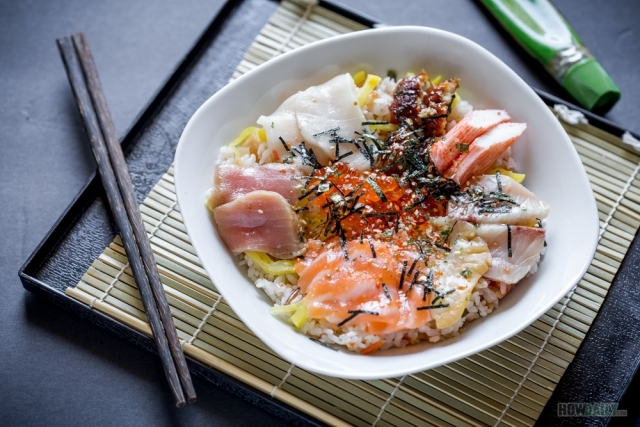 Usually you will find Chirashi with some sort of fish topping over sweet marinated shiitake and scallion. In Japan, the topping mostly salted fish and some pickled veggies. In the US, a typical mixed chirashi bowl will have raw tuna, raw salmon, sweet dream, kani, roasted eel, sweet egg and some salmon roe-ikura. Anyhow, it’s all delicious cause of all the variety in one rice bowl. Bu-en sushi is a type of bowl sushi, which comprised of “no-salt” vinegar cured fish atop sushi rice bedding. 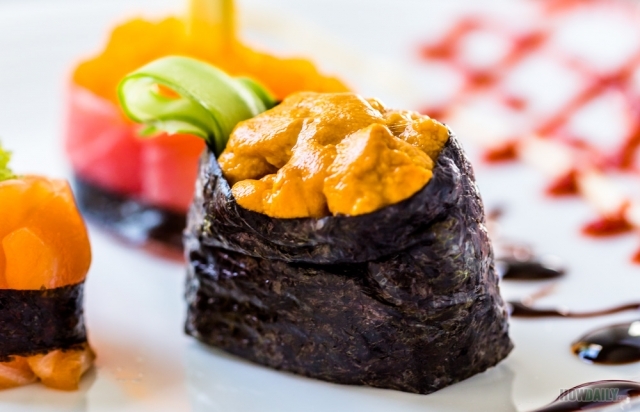 This is a special dish of Kumamoto that is a must served during wedding or special occasion. Commonly top with cured snapper, goby, and sea bream; which accompanied by dried shiitake, dried daikon, carrot and some burdock. Overall taste, sweetness with umami too. No salt really. Tekone sushi is another simple bowl sushi made with lean fish like bonito and tuna. 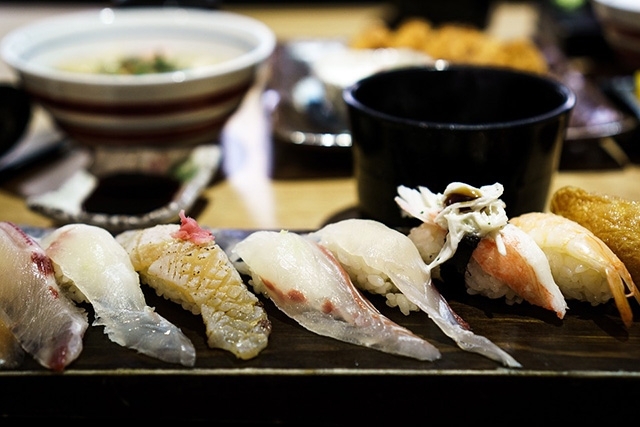 These fishes are marinated with shoyu sauce before embedding the sushi rice, together with garnishment such as flaked seaweed, ginger and large perilla leaves. Barazushi is also a dish in this category, is a dish of scattered sushi rice mix with lots of colorful vegetable and (sometimes) fresh fish. This is a moms made sort of dish for their daughter during Hina Matsuri (Japan girl’s day), which is why it is called Matsuri sushi too. The third popular type of sushi in the US is Inarizushi, along with nigiri and makizushi, these three could be found at any sushi deli/restaurant here. Inarizushi is the sushi type where sushi rice and garnishments are mixed and stuff in inari aburaage. What is Inari aburaage you may ask? It’s thinly slice tofu, deep fried, and sweeten by simmering in soy sauce. So in short, it is sushi in a tofu bag. Just like nigiri and maki, the number of inari recipes is limitless as any ingredients combination mixed to the rice stuff with tofu would create a fun variation. The taste? Juicy tofu with balanced seasoned rice, one of the nicest finger food there is. Chakinzushi is another stuffed sushi, but instead of marinated tofu pouch, it’s paper thin egg wrap to form a shape of lucky pouch/pot instead. A string of scallion often used to tie the pouch to represent good fortune. Also while inari is more or less an at-home-sushi kind of thing, Chakinzushi is served at festival and special occasion due to its decorative presentation and lucky symbolism(tying, wrapping, etc.). Similar to Chakinzushi, Hamagari sushi is where the omelette folded into quarter and stuffed with sushi rice and various topping ingredients(i.e. sesame, salmon roe, bonito flaked, etc.). It’s resembling a yellow clam shell, hence the Hamagari name. Alright, let’s get on to another stuffing. 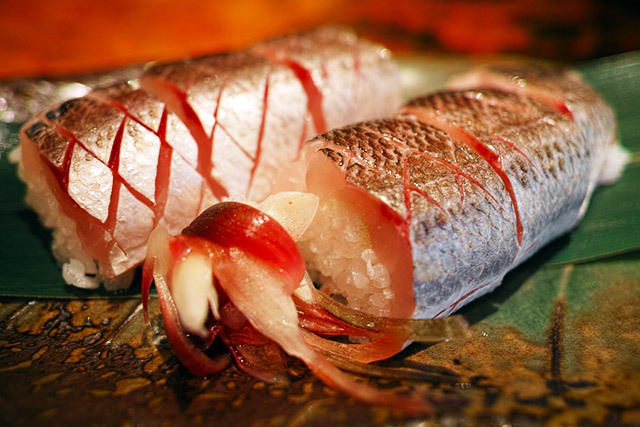 Sugata sushi is vinegared sushi rice stuffed in the whole fish. The whole fish is actually cured/coo so that it is edible. Main types of fishes used are mackerl, crucian carp, salmon, butter fish, trout, sweet fish, etc. Many regions in Japan employed this type of sushi as their traditional symbol though. A few restaurant in the US also served Sugatazushi, though the fishes used are quite limited. Kakinohazushi (persimmon leaves sushi), as the name implied, is the type of pressed sushi that is wrapped with persimmon leaves. Unlike most sushi, this persimmon wrapper is not edible, however, it is there due to its bactericidal nature and also to infuse the sushi with its scent.To make Kakinoha sushi, you would need a square mold and fill it with sushi rice and cured ingredients(i.e. mackerel, salmon, trout, eel, small sea bream –kodai). You would now pressed the mold to form a block of sushi and then cut it to serving size rectangular blocks. Each of these small blocks is then wrapped within salty pickle persimmon leaves, resembling a petite present-box I would say. After all blocks are gift-wrapped, they are all arranged back into the square mold, topped with weight and left in cool area a few days to ferment before consumption.Taste? Priceless, I would say. The fish has a mix of salt and vinegar with mildly scent from the wrapper leaf. This is the prize from Nara, the land with “no” sea in JP. Hakozushi: Osaka modern pressed sushi, which include high grade fishes such as snapper, sea eel, shrimps and other exotic seafood. Tazunazushi: “candy cane” stripes pressed sushi due to its topping slant distribution. Narezushi is literally fermented sushi, made by lactate fermentation of fish and sushi rice together. The ancient version’s smell was like a combination of blue cheese, vinegar and fish. This is why after the appearance of rice vinegar, Japanese are adapting to the faster fermenting process with vinegar, hence, becomes namanrina sushi or namanare. The one that started them all, for many of us actually. This was created in an attempt to hide the seaweed, but later on explode and become the foundation for numerous Western sushi roll. 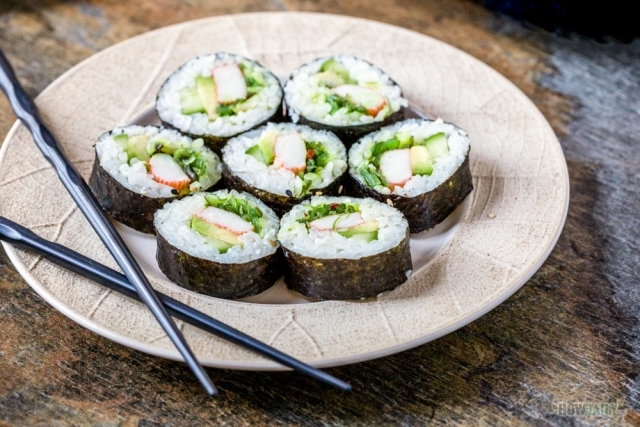 All the States basic, avocado, imitation crab -kani and cucumber; usually rolled as inside-out cylindrical roll. 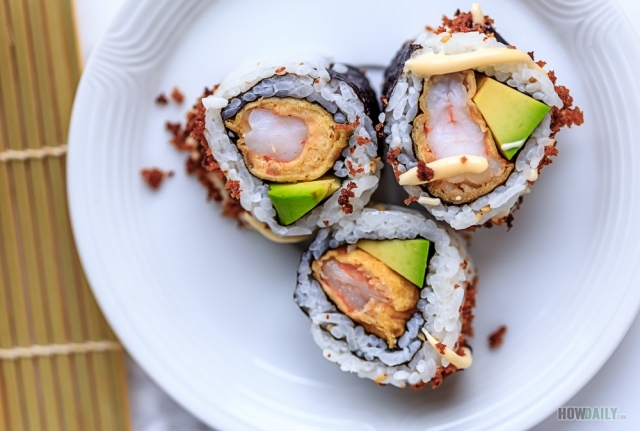 Deep fried shrimp tempura inside with avocado strips in an uramaki style roll. Topped with crunchy flakes and roasted sesame. One of the top famous rolls in the US and can be found at any sushi posts here. 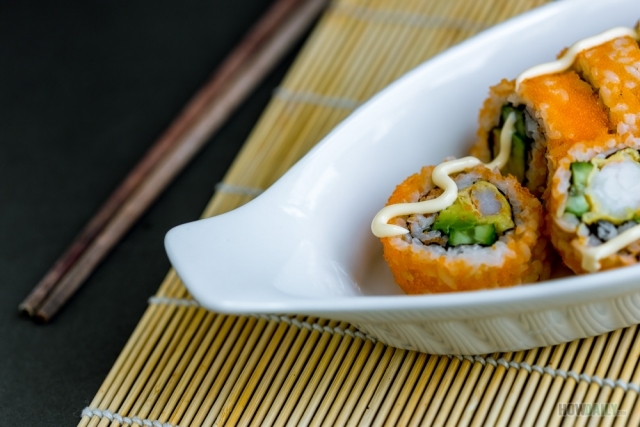 It’s virtuall an inside-out roll with shrimp tempura and cucumber inside. The outside is cover with sliced avocado to resemble the scale and roasted eel. Top with eel sauce and roes. Name due to its outward green covering (avocado) that resemble a caterpillar when arrange on plate. Fillings include kabayaki unagi (roasted fresh water eel) and cucumber. Fully cooked. Inside with cucumber and imiation crab and top with 5 kinds of fish (usually): tuna, salmon, white fish, yellow tail, red snapper… and avocado. Soft shell crab tempura deep fried and rolled inside with avocado and cucumber. Glazing with eel sauce. 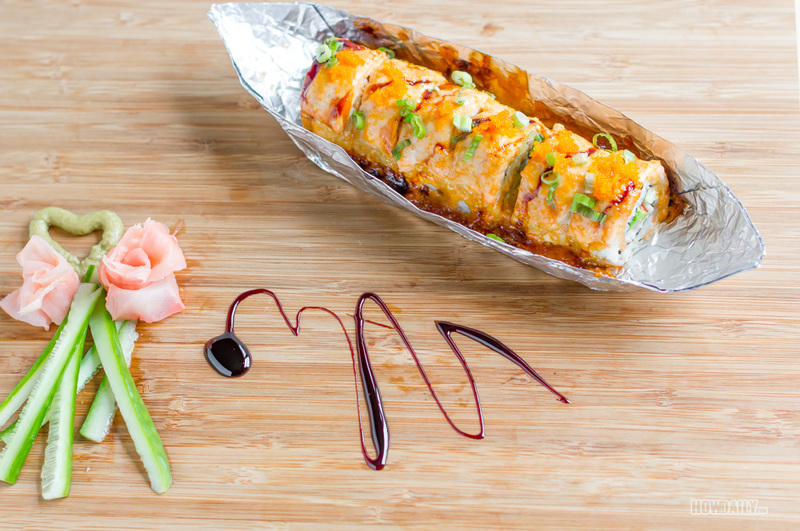 An inside-out spicy ground tuna roll covered with hot dynamite sauce, usually spicy mayo and load of optional toppings. The roll is lightly bake, torch, etc. to melt the sauce a bit. Complete flavor with smoke salmon, cucumber, avocado and cream cheese. A variety of vegetable filling: avocado, shisi leaves, sprout, asparagus, cucumber, carrot, etc. Diced shrimp, crab salad, tobiko and spicy mayo mixed together and top over California roll base. 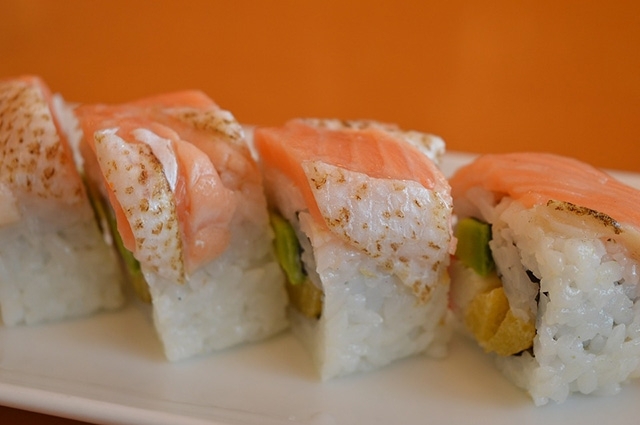 Typically an inside-out roll with imitation crab –kani and avocado inside (say California) with the addition of raw salmon on the either in or outside. Another uramaki filled with shrimp tempura, seaweed salad and shreded kani. It is then top with more Kani, avocado and eel sauce. Fully cooked. A small vegetarian starring Asparagus. Delightful and sweet, vegan approved. Molded in flower petal/water drop shapedsushi roll, it usually has a reddish/pink layer outside made of raw tuna or salmon. The inside filling is vastly differ, but usually contains avocado and shred crab meat. The roll is then slice and pieces are arrange to look like a flower. Eye catching and fun to eat. 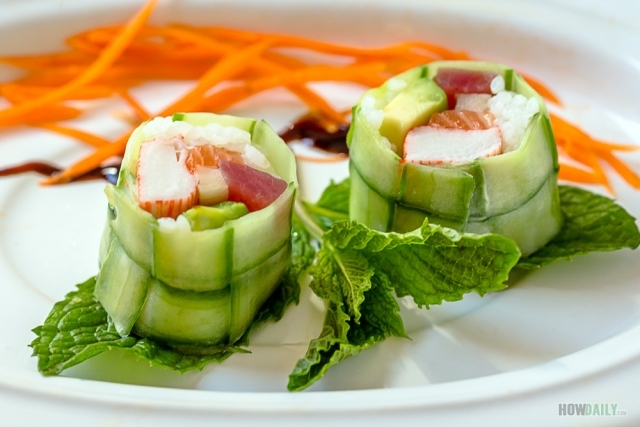 Another variation of the California roll, with thinner rice layer, poached shrimp (instead of crab) and the usual avocado and cucumber. 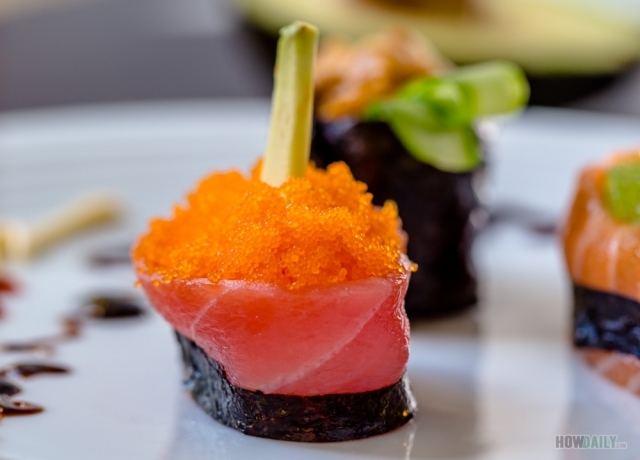 The outside is usually coated with red flying fish roe –tobiko to add more crunch. Contained BBQ salmon w/ skin and cucumber, more popular in Vancouver though. Cooked sushi with tuna tempura, avocado and imitation crab fillings. Stuffed with avocado, kani, shrimp and cream cheese then batter fried until crispy on the out side and glazing with unagi sauce. This is very high calories and hunger filled, as the name implied, mascular favorite I guess. Another uramaki style roll with shrimp tempura and avocado inside. Top with ripe mango and sweet & sour mango sauce. 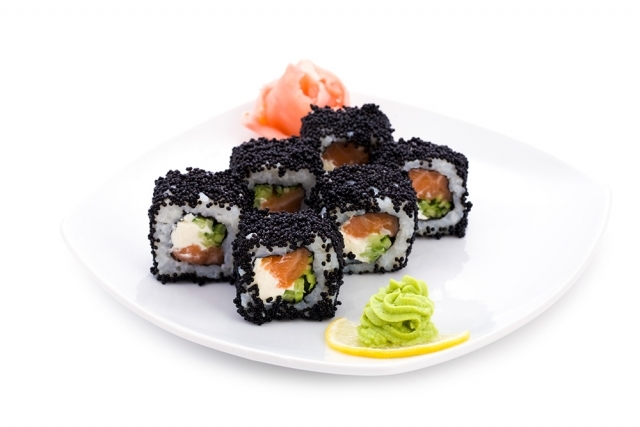 A variant of California roll with addition of seaweed salad and a lot of crunchy fried crumb on top. Avocado, spicy crab salad, salmon and pineapple. All wrapped perfectly in thin slice of cucumber. 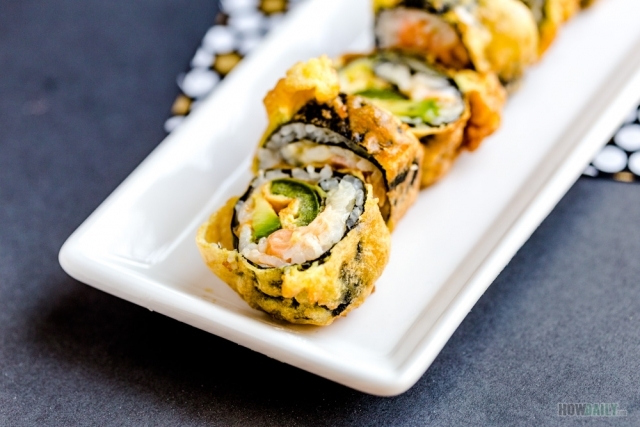 Fill with spicy salmon, avocado, cream cheese and unagi, then top with jalapeno and deep fry with tempura batter. Spicy crab, spicy tuna, cream cheease inside, topped with crispy tempura crumb and tobiko. Uramaki california roll with crab and avocado filling. Wrapped with salmon and load of spicy mayo, unagi sauce and tobiko. Oven bake and sprinkle with scallion. Tempura lobster, avocado and cucumber inside, out with eel and spicy mayo. 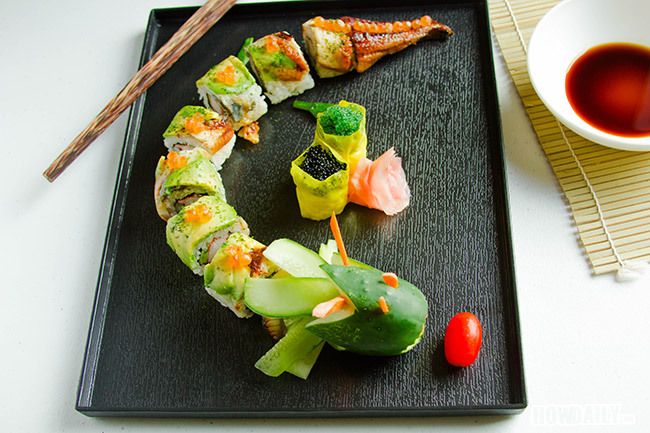 Spicy tuna, cucumber inside, topped with unagi, shrimp, avocado and tobiko. 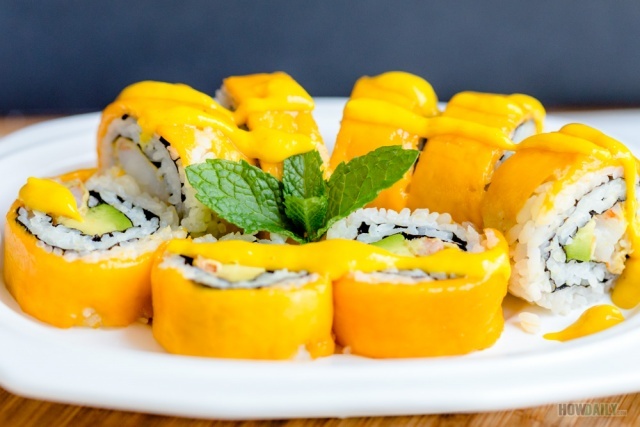 Uramaki of spicy crab, avocado, crasm cheese and top with salmon, mango and mango sauce. 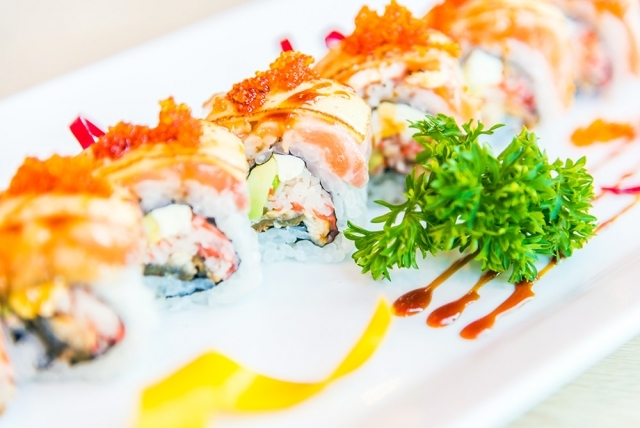 Uramaki top with salmon and fill with cream cheese crab salad and avocado. Tempura shrimp, crab, cucumber and avocado. Top with spicy mayo and eel sauce. Thin slice cucumber wrap around tuna, salmon, white fish, crab stick and avocado. A variety of picked ingredients as fillings, usually includes gourd strips, radish, cucumber, plum, etc. 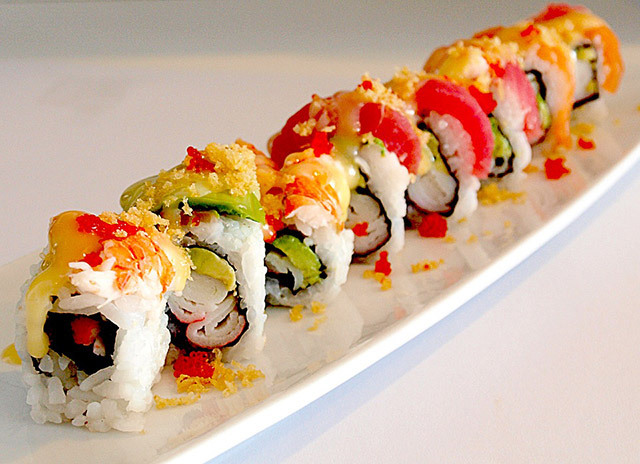 Shrimp tempura and cucumber inside, outside topped with spicy tuna and crunchy flakes. Salmon skin, toasted eel, avocado, lettuce, crab stick and crispy crumb inside and top with eel sauce and special seasoning. Shrimp tempura, spicy tuna and veggies inside. Spicy crab and avocado placing on top. Raw salmon, masago, cream cheese, cucumber and avocado inside an uramaki roll. Topped with smoke salmon. Salmon skin roasted and marinated filling inside with thinly sliced cucumber in an uramaki style. Sprinkle of sesame and scallion on top. Shrimp tempura, mango inside and top with scallop, shrimp, masago and kewpie. Cucumber, asparagus, blue crab wrapped inside. Out with imitation crab, hamachi, and tobiko. Spicy tuna inside with avocado. Outside packed with spicy salmon, mayo and tobiko. Spicy tuna with avocado and cucumber in an small roll style. Cucumber, shrimp and asparagus inside, topped with seared beef, garlic aioli, spicy scallop, ao nori. Glazing with chili sauce, ponzu and kabayaki sauce. Salmon tempura with cucumber inside. Out with more fresh salmon and avocado. Thin roll in uramaki style with tempura shrimp inside and load of crispy flake on top. Cream cheese, chopped bacon and olive inside. Out with flour tortilla wrapper. Top with shrimp over avocado and sour spicy sauce. 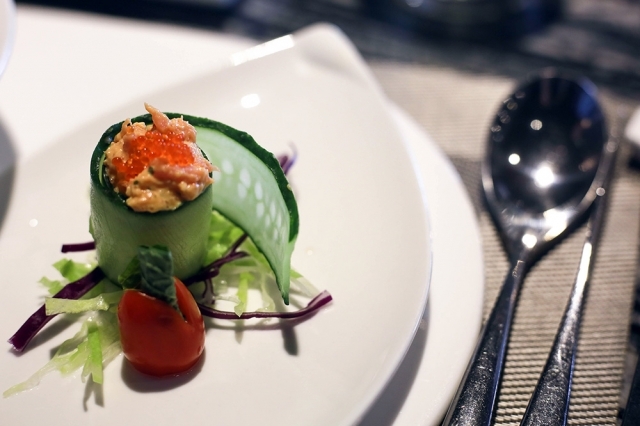 The inside is filled with spicy crab and cucumber. Unagi inside with cream cheese, crab, green onion. Roll is deep fried and glaze with unagi sauce, spicy mayo and tobiko. 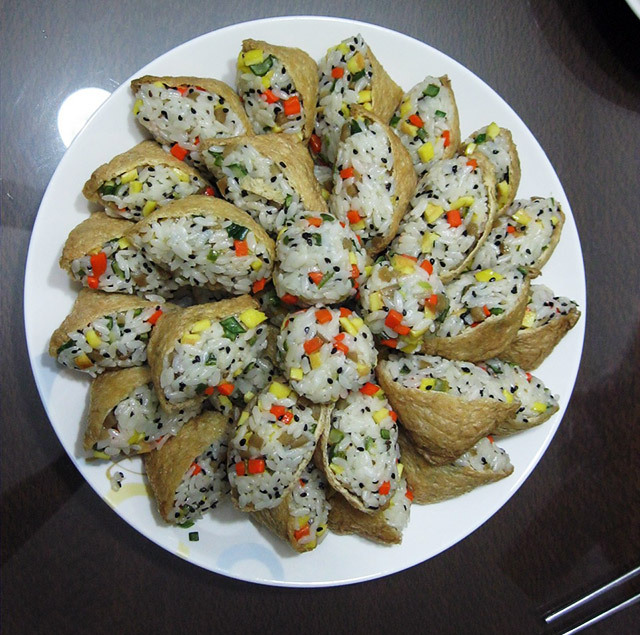 Inside filled with fried sweet potato and eel. Topped with mango and shrimp. Maki roll with salmon, tuna, white fish, tobiko and negi wrapped inside. Spicy yellowtail, scallion and cucumber inside, topped with more yellowtail sashimi. 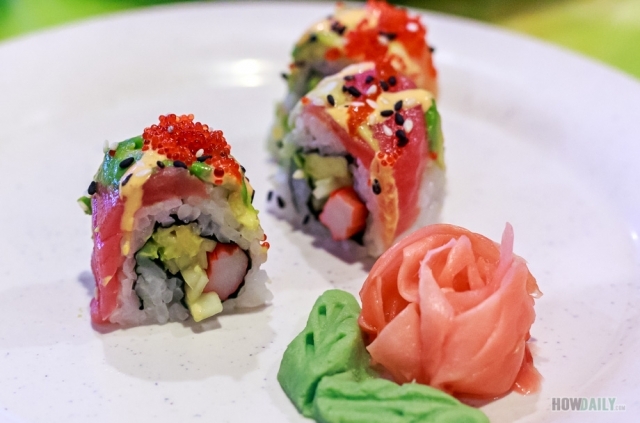 This is one of the best sushi roll article I have ever read. I love sushi and I love to know and try different types of sushi. I was wondering to make volcano roll at home with the help of my sushi tools. I am definitely gonna try all these sushi rolls. I hope it will taste good and kids will like it. 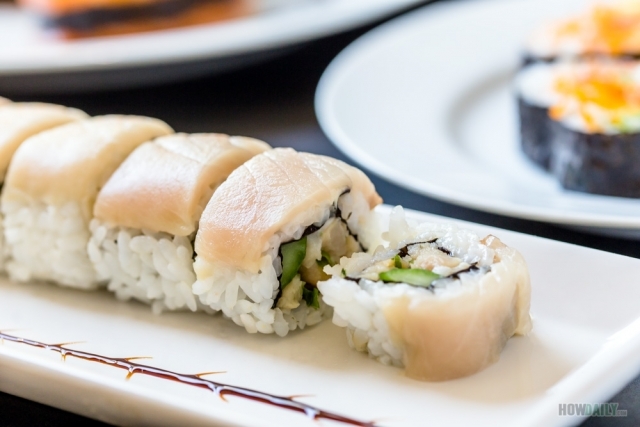 Thanks for sharing such an amazing article on different types of sushi.